Unlike other fish, which take in oxygen dissolved in the water via their gills, anabantoids have the extraordinary ability to breathe atmospheric air directly when necessary. They have adapted to survive in stretches of water that are often poorly oxygenated, with the aid of the labyrinth organ; this has also given them their other name of labyrinth fish. When breeding, most anabantoids build delicate bubble-nests: the male blows the eggs into a raft of bubbles of saliva he has formed at the water surface, and the nest itself is often anchored around floating vegetation. Pairs are often kept separately when breeding, because operating a powerful filtration system at this time would destroy the nest. Some of these fish grow to a large size and are often caught for food in parts of their range, which extends through southern parts of Asia into Africa. When seeking aquarium stock, be warned that the common names may be confusing or misleading in some cases. For example, the gourami (Ospkronemus goramy) may grow 60cm (24in) long, whereas the species often called the giant gourami (Colisa fasciata) is in fact unlikely to reach more than 10cm (4in) in length. 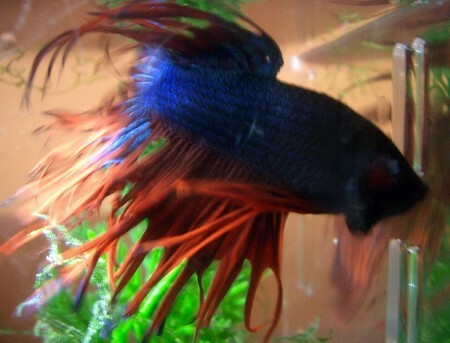 The peaceful betta (Betta imbellis) has an attractive iridescence and is considerably less aggressive than its close relative, the Siamese fighting fish, but it is also less handsome, having fins that are much less elaborate. This fish likes a degree of cover and will thrive in a densely planted aquarium. One of the most spectacular members of this group is the Siamese fighting fish (Betta splendens), which has been the subject of selective breeding in its native Thailand for centuries. This has led to the introduction of forms with elaborate fins, as well as those that are highly colourful. As their name suggests, these fish are aggressive and males must be kept apart from each other, otherwise they are likely to fight to the death. They can be housed quite satisfactorily in a community aquarium, however, although for breeding purposes you will need a small separate tank for each pair. Like other anabantoids, the female Siamese fighting fish does not lay the eggs herself in the nest. They have to be collected by the male after spawning. He then fertilizes them, puts them in a bubble-nest, and guards the site until after the fry have hatched. If you are rearing these fish, you should provide them with a suitable proprietary fry food or rotifers, because they have small mouths and may easily starve if supplied only with food items that are too large for them. These fish generally have vertical brown, metallic blue, and red bands across their bodies. Although they come from southern Asia, the paradise fish (Macropodus opercularis) is remarkably hardy, being unaffected by water temperatures as low as 10°C (50°F). Nevertheless, these fish are far more likely to breed in heated water, with the male constructing a typical bubble-nest. Make sure that the spawning tank is densely planted, to provide cover for the female, because otherwise the male may bully her in these surroundings. It may be worth adding some bogwood, which is often used as a point of attachment for the nest. The tank should also be covered, first to stop the fish leaping out, and subsequently to prevent chilling of the fry. Spike-tailed paradise fish (M. cupanus) require similar care, but algae often features in their diet. These fish may vary in colour, with their body being mainly brown. The distinctive spike on the caudal fin may not be apparent in specimens that have been housed in poor water conditions, or in the company of fin-nipping species, but it should regenerate in due course. Kissing gouramis (Helostoma temmmcki) make a wonderful sight as they engage in the extended bouts of kissing from which they get their name. In fact, they are locking mouths in peaceful trials of strength. They use their prominent, thick lips to graze on algae, as well as for their more renowned pastime. The domesticated form is silvery-pink, while wild specimens have a greener hue. Take care to include plenty of vegetable matter in their diet, although even with this they may destroy aquarium plants. 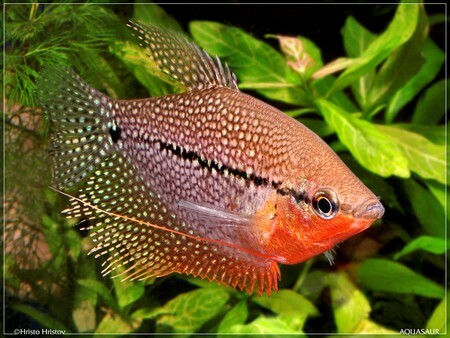 The pearl gourami (Trichogaster Iccri), also known as the lace gourami for its characteristic patterning, is one of the most popular species. Like some of its relatives, it has long, thread-like pelvic fins, which are equipped with taste buds at their tips to assist it in finding food. Most fish do not utter audible sounds, but the croaking gourami (Trichopsis vittatus) is a notable exception. You are most likely to hear its distinctive calls during the spawning period, although these fish are not easy to breed successfully. As for related species, keep the water level low in the spawning tank, at about 10cm (4in), and increase the temperature to 30°C (86°F) in order to encourage egg-laying. The moonlight gourami (Trichogaster microlepsis) is instantly recognizable by virtue of its tiny scales, which give it a striking silvery sheen. Include plant material, such as Myriophyllum, so they can incorporate it into their bubble-nests. Equally striking perhaps is the stunning golden form of the three-spot gourami (T. trichopterus), one of various attractive colour forms.